Munster have just escaped from Castres with an unlikely draw. We could easily have been two penalty tries down and two players short before thirsty men who take a long time to pee had time to take up their seats. We were haunted. Someone somewhere was looking after his team. It's a year today since Anthony Foley was taken from us. I miss him very much and I was just a friend. So I can only imagine how tough this last 12 months has been for his beloved family. Olive Foley was the most impressive Irish woman of 2017. She honoured her husband and when the tributes were done, Olive went home to Killaloe to take care of her sons. I meet Axel's sisters and his parents often. The Foleys are talkers and more importantly they are communicators. They are the type of people who always see the positive and I'm sure they too believe Anthony is somewhere near. So is there a life hereafter and do our loved ones stay on with us? Last night I got a terrible desire for chips with curry sauce. Axel loved secret chips and we had a bag or two in our time. Axel made me eat the chips. My fingers are brown from curry sauce. When I was buying the paper yesterday morning a woman asked if I smoked. "Only passively," I replied. "But your fingers are stained," she said. It was Axel's fault. I was talking to Keith Wood during the week and he told me of a great night he had with Axel and a bunch of friends. When Axel was under terrible pressure Woody was close to him. Woody made him do a Kerry accent and he was laughing. Axel was happy. That means so much to us, his friends. Axel knew where the love was and it was in his own home with his wife and kids there beside him. I'm sitting here looking out at the trees in their autumn finery in the same place I was when the terrible news came from Paris. The shock of it all returns but I prefer to remember giving my friend a hug in the interview room under the Millennium Stadium when he captained Munster to that famous first Heineken Cup. The sadness is still there and the unfairness that such a sudden parting should be visited on such a decent man makes me angry. But in our search for understanding we have to look beyond anger and grieving. Some of you may say the very idea of spirituality is no more than a coping mechanism for the bereaved. They might even mangle Marx, and preach "spirituality is the Xanax of the people", but I disagree. Those who have passed on are in our thoughts and just as importantly their old advice guides us and guards us. Foley's word and deeds also remain in the consciousness of his team. Now they know what it is to be Munster. His team are always committed. We can ask no more. I do not believe a man who loved his family and place would ever leave for some sterile void of no consequence. Feel free to disagree and it could be you would like maybe to look to Axel's legacy. 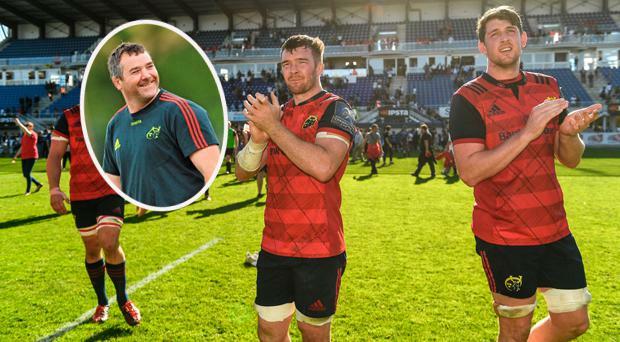 Anthony Foley was an honest man who was good to his players. The acts of kindness and support became public when he passed away. Players like Ian Keatley owe their careers to Axel. There were some Munster fans who turned against him and some of that some were cruel. But I would imagine now that they know how hard he was working and how much he was doing right they must surely feel some guilt for the way they treated the brave man who was our captain and hero during the glory years. The unfair criticism did affect him. He told me so. So maybe the true story of Axel Foley will teach us to care for others. The kindness, loyalty and decency of Anthony Foley survives beyond the grave. We should always take on these life lessons from the careers of great men and women, to make sure their deaths have not been in vain. We owe Anthony Foley that much and more. And not just in a rugby world but throughout life's salient interfaces. Munster will be very much in need of The Lost Leader next week against Racing in Thomond. Munster were very, very lucky to draw with Castres. Foley must have been on as 16th man. How else can you explain the early penalty try escapes? And he definitely came back for the last three minutes. Castres missed an easy kick to win the game in the 78th minute when a strange sirocco blew the ball off course. Just had to be Axel. He was always puffing like mad in the 78th minute. Just after that a Munster hand tapped the ball down and it was a certain penalty but the referee didn't give it. Homage to Foley maybe on the day that was in it. And then a last-minute drop goal in front of the posts was puffed madly to the right.